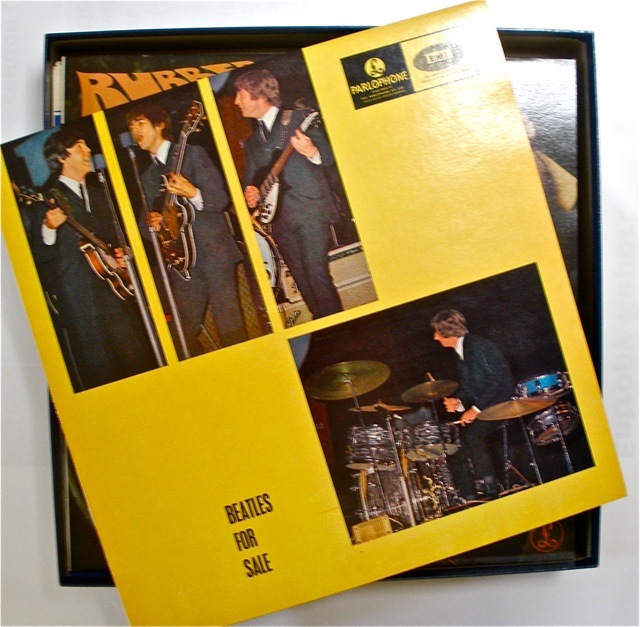 Not one, but two large Beatles box sets from the collection to feature in this post…. Well, both are Australian editions of “The Beatles Collection” – a box containing all twelve official Beatles studio album releases, plus one disc of “Rarities”. But the two examples of this box-set here differ in quite a few ways and are worth noting. 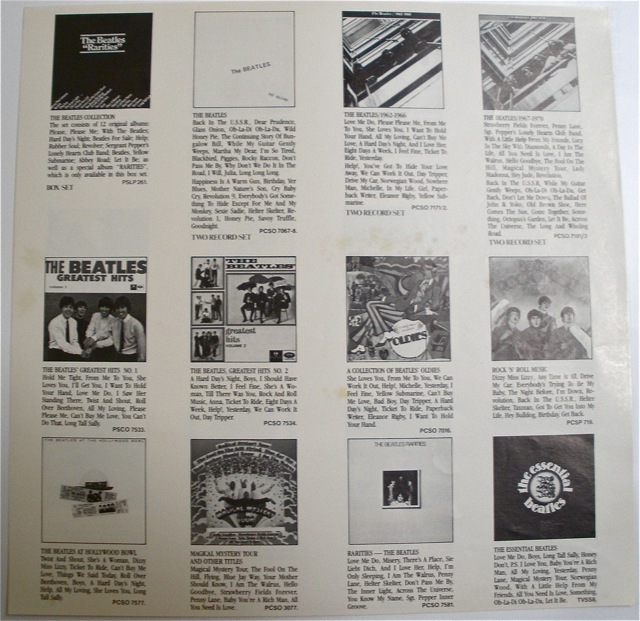 I’m not sure that this sheet was originally included in the mid 1980’s box set as it has the catalogue number PLAY 1005 on it and this was an insert usually included with Australian copies of “The Beatles Ballads” LP from 1981. Anyway, it’s nice to have. 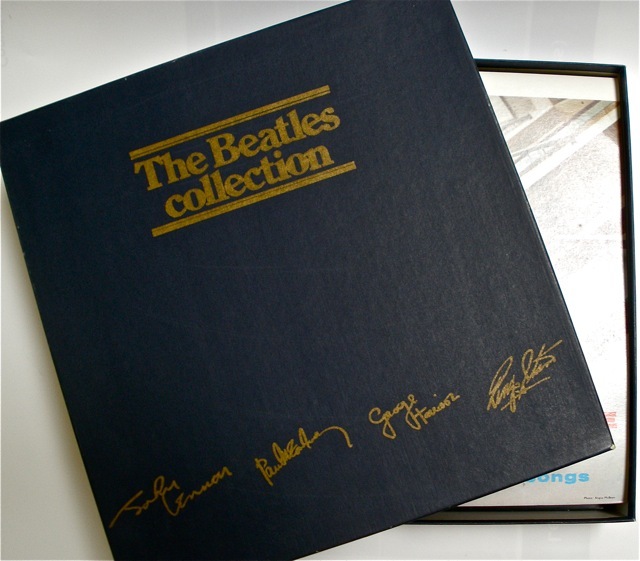 So, two “Beatles Collection” box sets with quite a few interesting and collectable variations. (Many thanks to Jaesen Jones and his invaluable book “An Overview of Australian Beatles Records” for the release date information contained in this post). 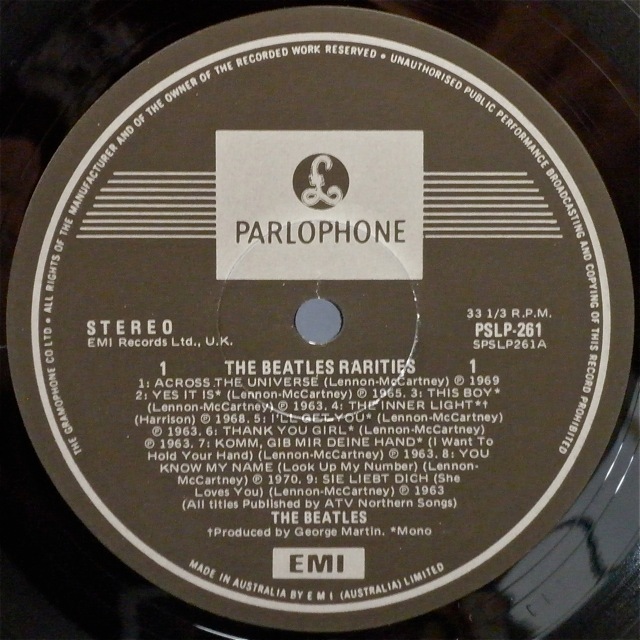 This entry was posted in Beatles, Beatles Music, EMI Records, Parlophone Records and tagged Beatles, Beatles Collection, Blue Box, Music by beatlesblogger. Bookmark the permalink. Thanks Nugoho. Here’s the Google translation of your comment: “Wow! What a cool, awesome collection. Hi, I’m Nugoho from Indonesia … I am a fan of The Beatles – especially George Harrison. Glad to share info with others about The Beatles”. Thanks for your contribution and feel free to send us some images of your Indonesian collection! Hi there, we have just found a single sleeve, orange parlophone Sgt Pepper’s LP. Inside is a ‘poster’ with lyrics on on side, and a collage on the back. Just wondering if you think this could have come from one of these collection boxes? Hi Claire, just checked and both the boxes I have don’t have anything like this. Both are single sleeve Sgt Pepper releases, but don’t have posters with lyrics and a collage…..sounds interesting though. Could you send in a photo and maybe someone else will have the answer. I have the Blue Box Set with the poster as well. Very unique with collage of several unusual photos. 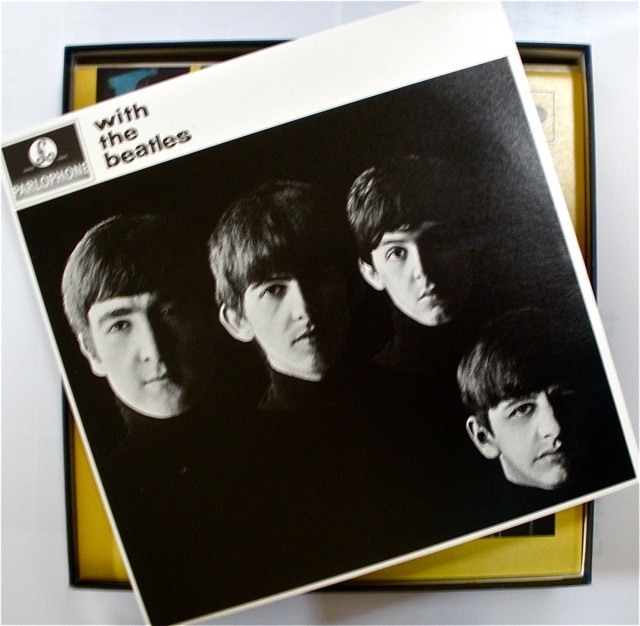 I have never seen it before, and it clearly is not the same as the White album poster. Hi Claire. 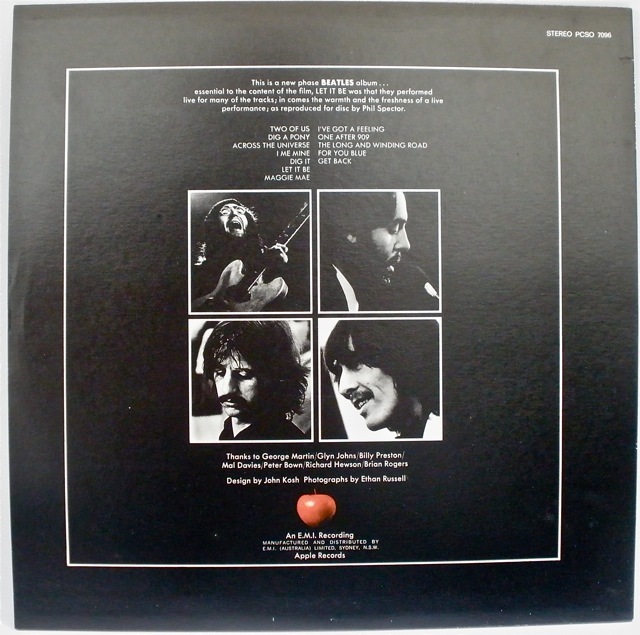 It sounds like the poster that was included with the “White Album”. it could have been placed inside the Pepper cover in error. Hi, finally I found more info about Australian BLUE COLLECTION BOX SET. I noticed on eBay that people are selling this box but I noticed it was slightly different . I purchased my in Australia and it is the one with the LP titles listed on the back of the box (1980). BUT ? – LP FOR SALE is in different artwork : black and silver Parlophone label (EMI made in Australia) stereo PCSO.3062 gatefold. So was there a third AUSTRALIAN version of this box set. ?? Does anybody know? @Tereskovova: Around mid/late 1982 EMI Australia introduced an Australian-made replica of the UK BFS sleeve (following on from PPM and WTB). Unfortunately though, it was quite flimsy and prone to damage (ring wear and feathering in particular). It wasn’t in production for long, disappearing by 1983. Perplexingly, while EMI Australia assembled their boxsets from standard production stock of the day, the only copies of BFS with the gatefold sleeve I’ve seen have been in copies of the boxset. So if I understand correctly there is no way to recognize the box with UK sleeves. Contents of the same box could be different just because what LP was at that time available on EMI shelves? Correct. The UK replica sleeves were available thus: PPM (Dec 1980-1991), WTB (1981-1991), BFS (1982-~1983). 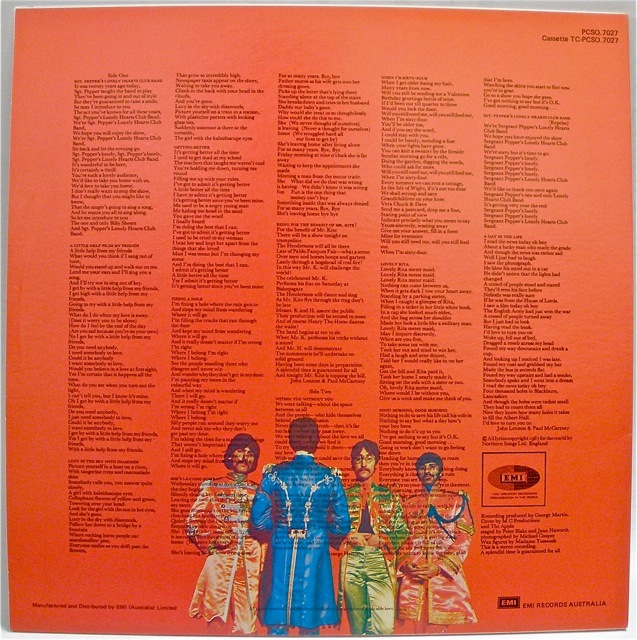 The blue box with the album titles written on the base was introduced in mid-1980, thus, if the box has the album titles written on it, there is no way to tell which sleeves are included unless you can physically see them. Of course, the odds are the set will include at least a UK replica PPM, but no guarantees unless you can see them. In any event will very unlikely contain a UK replica BFS sleeve given the limited run. 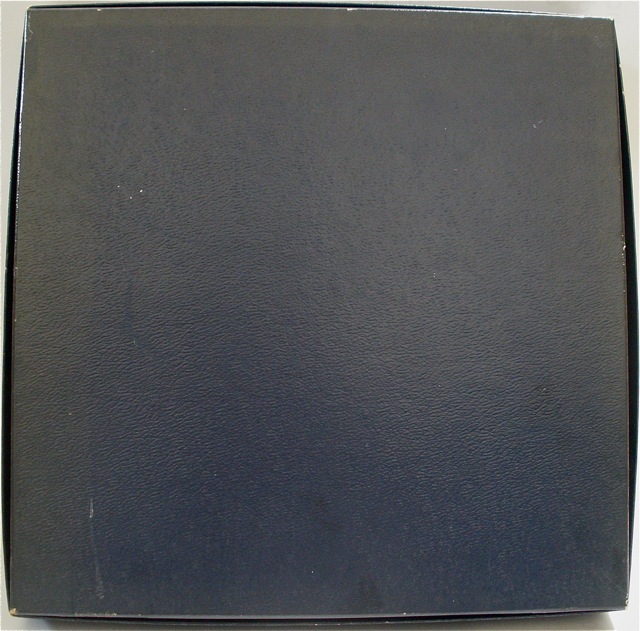 As an aside, earlier boxes didn’t have the album titles written on the back, so if you see one of those, it’s safe to assume the sleeves within are all original Aussie. You can buy a gold box, however, and be assured of the sleeves within because it was introduced in 1984. More expensive though. How much is the blue box worth? These seem to go for anywhere between Australian $150-$250 depending on the condition. Upon reading your above detailed description of your Blue Box Beatles Collection. I realised that my box is exactly the same and was wondering if you have much idea of the value of this item? It’s a fascinating thing to own and research, however there just seems like endless sites all claiming different things. Hi Deb. These seem to go for anywhere between Australian $150-$250 depending on the condition. If in absolute mint condition expect up to $300 or so. Hope this helps. 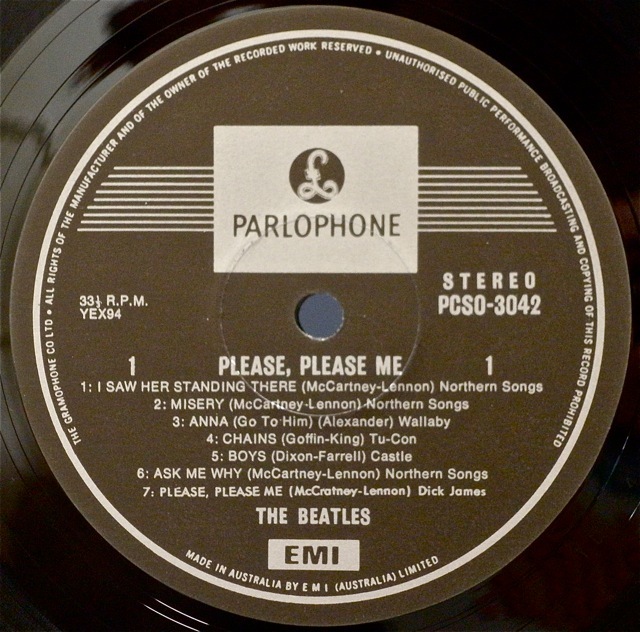 Hi – picked up a copy of the Beatles Rarities pressed in Australia however it has the EMI Red & Tan label – it is issued as PSLP 261 same as the ones listed above. It has the same blue cover and comes with the “sampler album not for sale” as the usual edition. Have seen overseas editions on the Red & Tan label such as Mexico and Israel but haven’t seen any versions of the Australian album. Just wondering if this is a later reissue in an old cover or if it is some other edition – the matrix numbers are SPSLP 261A & B which appear to match the 1980 Second pressing of the album. It has more info and images. Hope this helps! Dear BB – thanks for the prompt and extremely helpful replyand for the introduction to another stunning Beatles resource. Its just a shame that this album has been split from its original box set – it was with a group of 9 orange label stero reissues that probably came from the same box – i couldnt help but snap them up as well as they were only $10 each. These are now all safely homed with the rest of my fledgling Beatles collection. We posted on it back in 2010 when our photography skills were not that impressive. If you click on individual images you can see a slightly larger version. These box sets where very nicely done. The fact that you picked one up for $20 is a real bargain. It would be worth a lot more than that now. I’d estimate that box would go on Ebay for around $150-$200. Even with a couple of rust stains! Not sure there’s a solution for getting those stains out. I think they’re there to stay sadly. Nice that you have the Australian LP blue box as well. 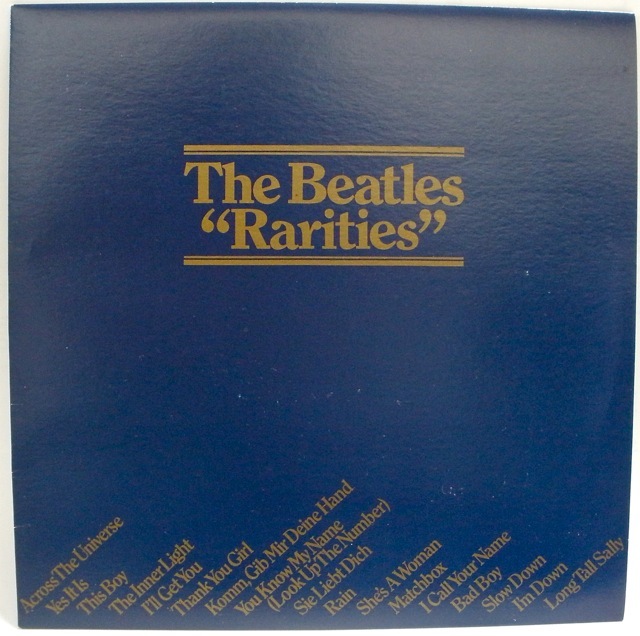 The “Rarities” LP on the EMI label means it is an early pressing and therefore more rare. 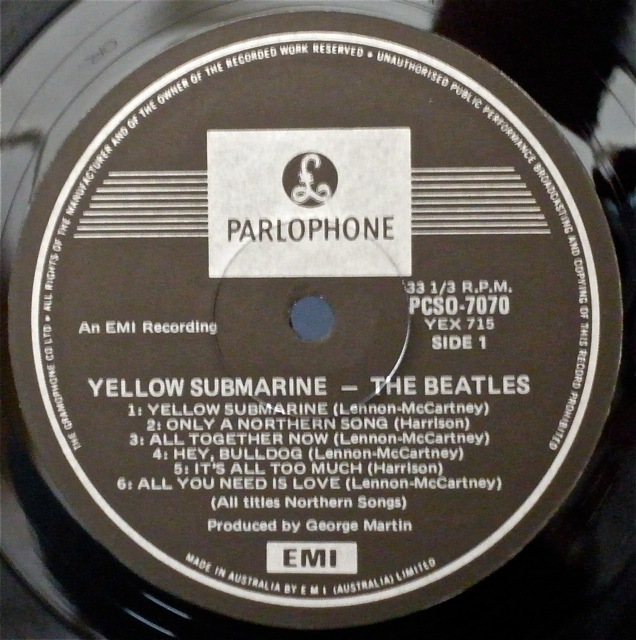 These were only produced in limited numbers before going onto the more common Parlophone label. An elderly friend has given me Blue Boxed Set to investigate and possibly sell. I have read the descriptions above – very thorough thankyou but am a bit confused. The set I have seems to be the second edition because it is in a cardboard box and has names on the bottom of the box. But I have four albums with Apple label and the rest with the orange Parlaphone. 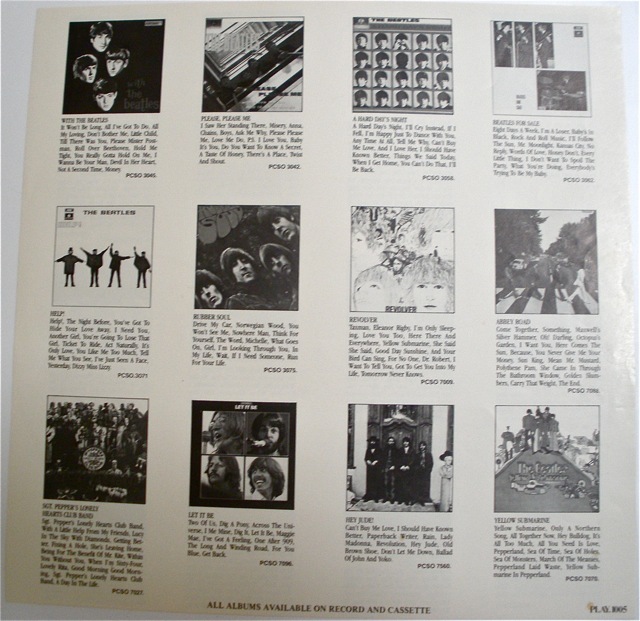 I also have the two unique Australian covers – With the Beatles and Beatles for sale. 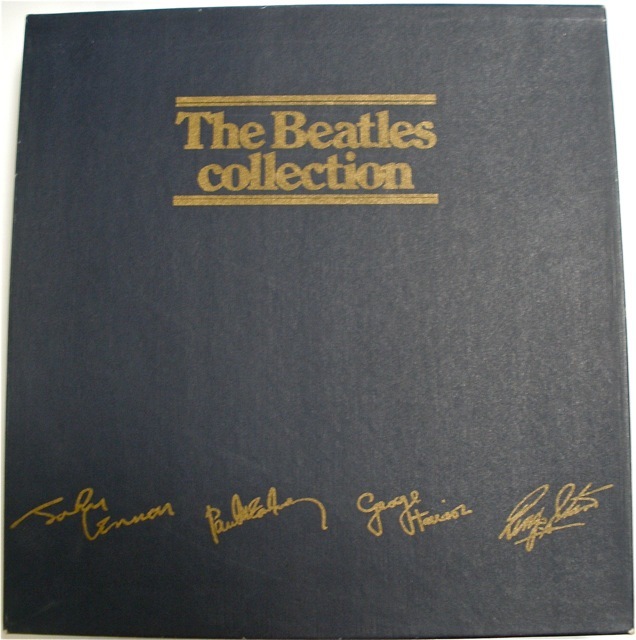 Hi Lynne, the Blue Box for all Australian editions has the four Beatle signatures at the bottom of the front of the box lid. The differences between the two versions mentioned in our post was that the titles of each album were on the rear of the box for the second, later edition. 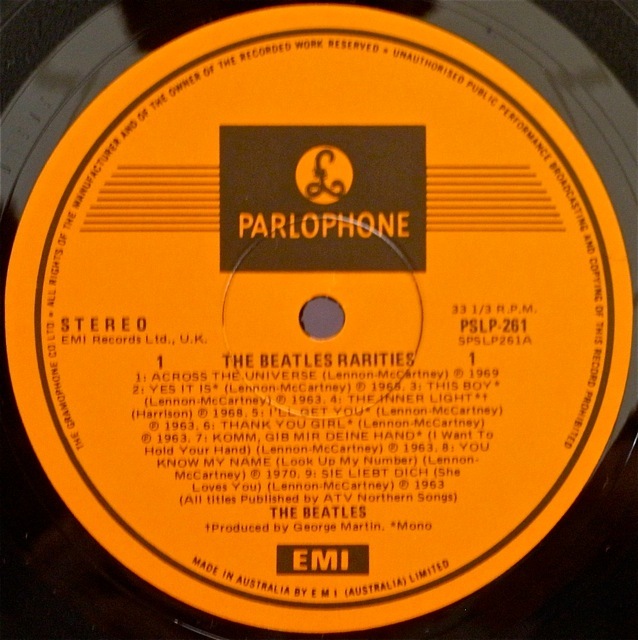 However, as these boxes where made up of LPs with label and album cover styles that EMI had in stock there could well have been some overlap in filling the boxes – in other words some of Orange Parlophone/Apple labels may have made it into the second-run of boxes which had the names of the all the albums printed on the back of the box. I’d say you have one of these editions because you have all Orange Parlophone labels for all but four of the titles. Those four should be on the Apple label (they will be “The Beatles” White Album, “Yellow Submarine”, “Abbey Road”, and “Let It Be”). 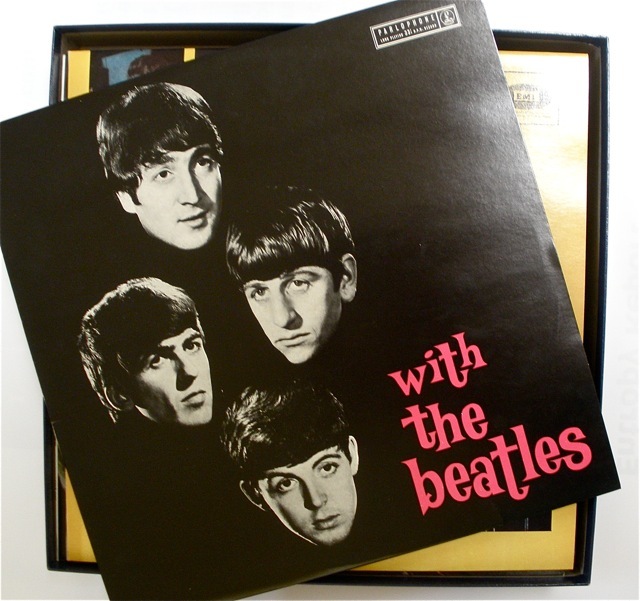 There should also be the unique Australian covers for “With the Beatles” and “Beatles For Sale”. So, sounds like you have a cross between the first and second editions (that is the earlier albums in the later style box). Hope this helps/makes sense. If it is a good set in good condition you should get around $200-$250. Sounds about late 1980, early 1981, ie after the introduction of the new box but before the early 1981 introduction of the UK-replica WTB sleeve. The PPM sleeve will seal it though – if the front cover has the title written in BLUE along the top, then it’s earlier (sometime during 1980). If it’s BLACK, then the box is from 1981. The writing is Dark Blue across the top so I presume 1980. Is Ebay the best place to sell or is there a dedicated vinyl site for collectors?? This is a great site thanks. Yeah, try ebay. 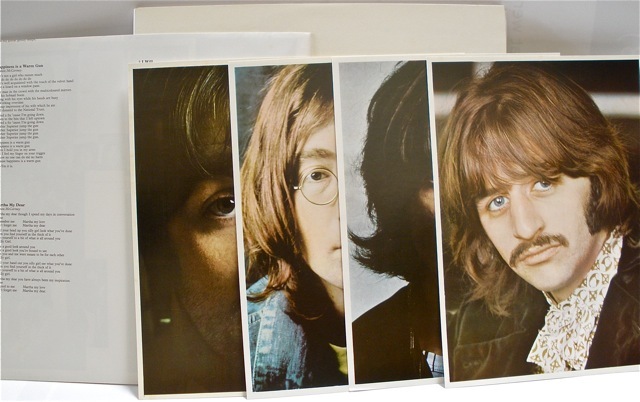 As beatlesblogger says, you should get somewhere between $200-$250, assuming a good description and photos (I think you can have up to 12 photos for free – I’d use them to show any flaws, or if no flaws, to highlight the quality). Thankyou. The ebay post is on the way. I purchased the beatles blue box set in mid 1983. 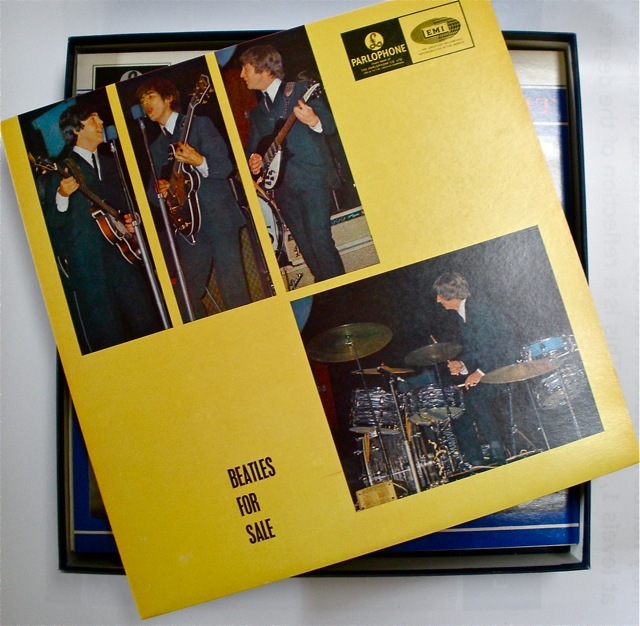 My set sounds similar to your other box except (with the beatles) is the australian release cover as with (beatles for sale). 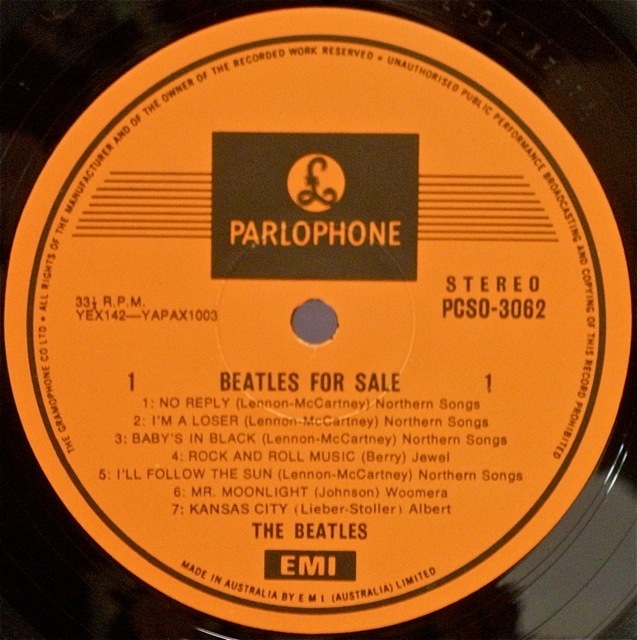 All the albums came with the black parlophone label except (please please me and beatles for sale) which came with the australian release orange label. Any idea where I can get a blue box from, someone stole it (only the box) many many years ago. Hi, I’d look in eBay. 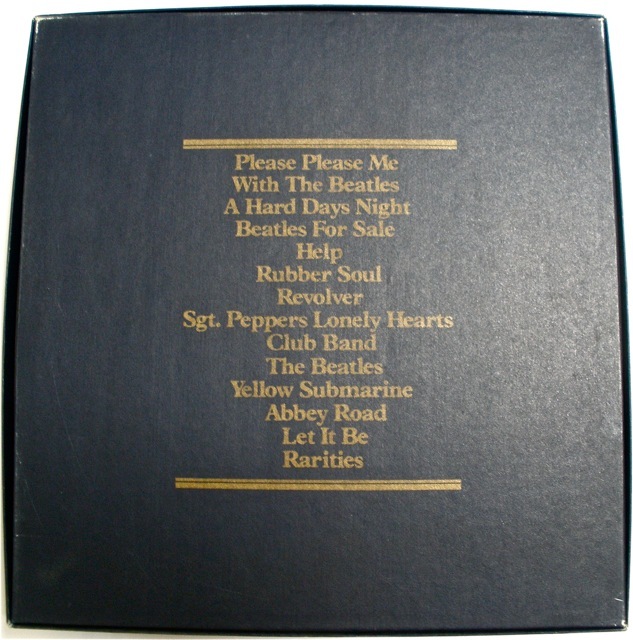 Type in your search “Beatles blue box only”. It often comes up with people who have a box and no records for sale. It might take a while but if you are persistent you will find a box to house your records. Thanks for the great site. I enjoyed the piece on the blue box set of LP’s. My Mum won a set in the late 70’s. I played it constantly then and as a teenager this set me up as a Beatles fan for life. Mum has now passed the box set to me. However it appears that the White album is missing. To replace it I’d like to find a copy from around that time so I can keep the set somewhat original. I remember the copy having a green serial number and the poster and four head shot photos. They were Apple records. Were they particularly special if they were in the blue box? Or were they just regular Australian pressings you could buy in a store rack? Hi Michael, dragged out both the Australian Blue box sets we have and had a look at the White Albums in both. They are regular Australian pressings from the day. 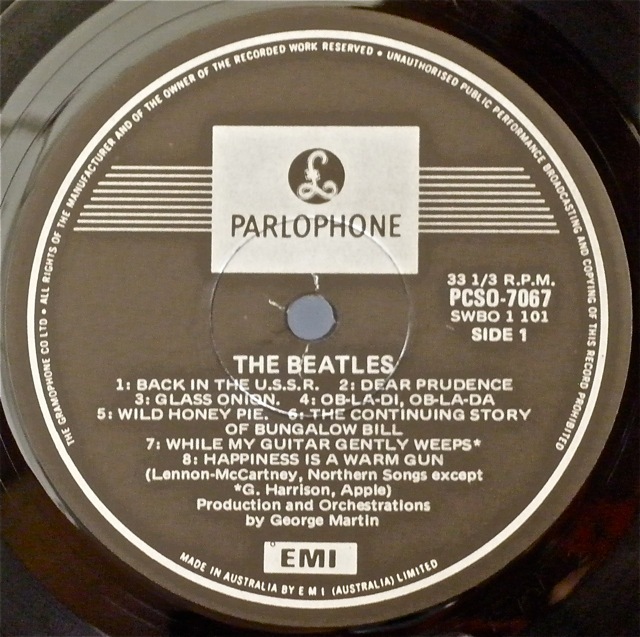 One on the Apple label, one on the black and silver Parlophone label. There is no green serial number on either. Just the plain white sleeve. Each has the four individual photos and the poster. You should be able to pick up a copy of an Australian vinyl release like these to complete your set. Thanks for the previous help with the White album and the LP box set. I did eventually get one from eBay. I’ve continued my boxed set quest and this time scored an empty roll top box from 1995. It seems empty ones could be bought new. Gathering the CD’s is something I’m looking forward to. Shouldn’t be too hard to do that although I am keen to get CD’s from that period. However the 64 page booklet might be a challenge. I imagine it was never available on its own but maybe there’s an orphan one out there somewhere? Turns out that’s exactly what I did too. My brother at one time owned a CD store and somehow ended up with an empty roll top box which he gave to me. Initially I had an example of each CD in there, but they were from all over the place (Australia, USA, UK, etc.). About two years ago I determined to make it an entirely Australian set and slowly but surely picked these up, usually at reasonable prices. It is now complete and quite nice to have. Good luck with your search! Keep an eye out for the booklet. You may find one. If I see one I’ll let you know! Hi! Thanks for keeping an eye out for the booklet. I’ll give you my email address offline. I have to say I’m looking forward to gathering up the CD set individually. So they were Australian made CD’s in the imported roll top box? They weren’t imported already filled? You know I was working for a CD manufacturer in 1988. I may even have helped make the CD master. Hi, I think they were filled with CDs of the country they were released in. Living in Australia, I wanted to get all Australian CDs for my set as this was the way they were sold by EMI back then. Cheers. An Aunt of mine has the Gold box vinyl album set im mint condition, still in the celophane packaging, signatures on the bottom face of the box with the set serial number as purchased, she is looking at selling the set, just trying to get an idea of its value for her. Any ideas or suggestion would be helpfull. 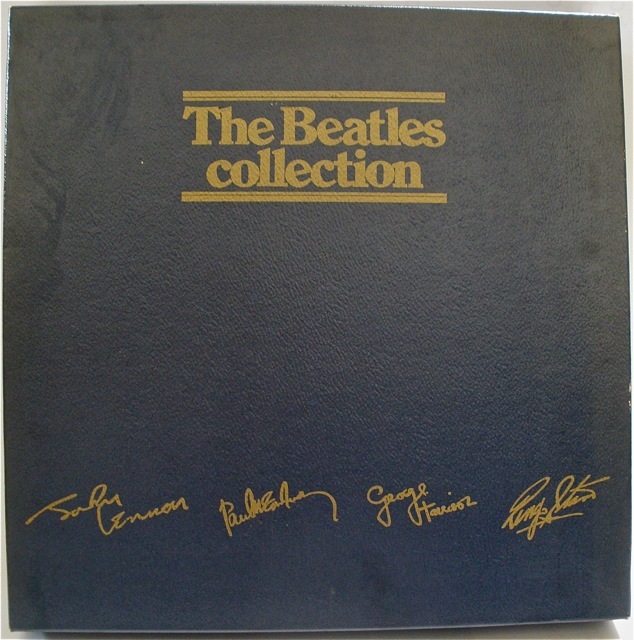 Hi, the gold box sets are difficult to find in good condition because the gold paper EMI Australia used damages easily. There is one box set on EBay at the moment with a starting price of $500. This is probably a good indicator of its worth. Hope this helps. Hers is in mint condition, I’ll let her know. Hi, I just picked up a box set today. Been trying to get my hands on one for ages! Mint condition and most of the records have never been played. It looks like I have the second one but mine has all the record labels matching up with the first box. 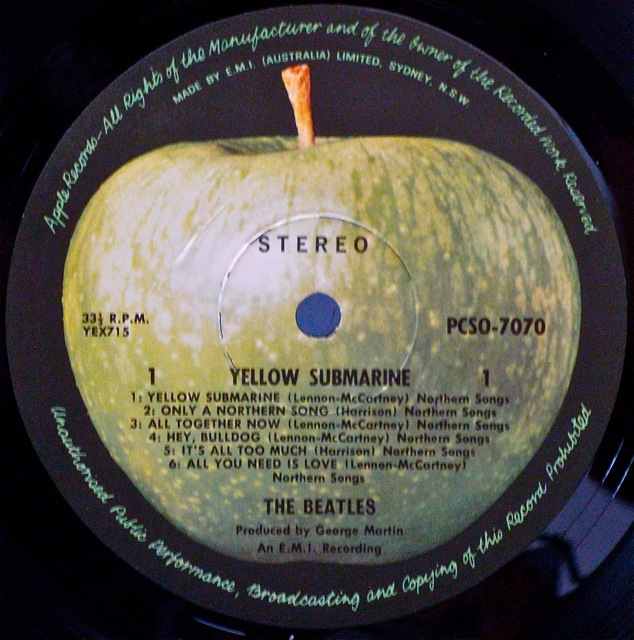 Abby Road, White album, let it be and yellow submarine on Apple labels. Also revolver is the black and silver label but it’s a New Zealand copy (says nothng about Australia) but the sleeve says printed in Australia. Just wondering if that was normal at all?